There are so many, many negative things happening all around us. People giving up on life. People taking others lives. Mean ungodly things happening to seemingly good people. Unbelievers walking around thinking that they are in charge of themselves and everyone elses' destiny. If I were a text expert, my next sentence would be in capital letters; as to signal my shouting voice. Do not believe the hype. We must give God the praise always, always, always. He is the only one that can help us through these rough and unstable times. Violence is rampant. Liars are a dime a dozen. Vanity is so prevalent it isn't funny. And greediness oh I say no more. 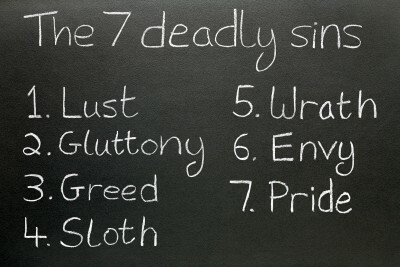 I think that about covers the seven deadly sins. Pray every day with your whole heart and soul. Ecclesiastes 6:7-9 All the toil of man is for his mouth, yet his appetite is not satisfied. For what advantage has the wise man over the fool? And what does the poor man have who knows how to conduct himself before the living? Better is the sight of the eyes than the wandering of desire; this also is vanity and a striving after wind.